Predicting the future price of Bitcoin and other cryptocurrencies is a fool’s errand. If you believe otherwise, take a look at BitcoinObituaries.com, which provides a running list of articles from publications such as The Economist and The Wall Street Journal that proclaim the end of Bitcoin is nigh. Next to each headline is the price of Bitcoin at the time the article was published. The very first article listed is from 2010, when Bitcoin was at $0.23. Over 180 articles later, Bitcoin is worth over $8,000. Despite what the high priests of finance may say, cryptocurrencies are not going away. However, this does not mean there is no cryptocurrency market bubble. In fact, the signs of a bubble are all around us: sensational news stories, price volatility, fraud, and buying on hope. In this article, we make the case for why the cryptocurrency market – including initial coin offerings – is currently in the euphoria phase of an asset bubble. We refrain from making any predictions about when and how the bubble will burst; doing so is every bit as much the fool’s errand as predicting the future price of Bitcoin. In a follow-on article, we will attempt to dissect the eventual impact of the bubble bursting and examine whether a cryptocurrency market bubble could in fact be beneficial to society. Displacement: Some new technology or financial innovation leads investors to believe economic growth and profits will increase. Boom: Increases in the asset price steadily climb, eventually outpacing the fundamental improvements associated with the new technology. Euphoria: Prices increase in a speculative frenzy as investors buy the asset simply because they believe they can sell it to someone else at a higher price in the future. During this phase, intelligent investors may become aware there is a bubble occurring. Profit taking: Sophisticated investors, wary of a bubble, begin reducing their positions and harvesting profits. Less sophisticated investors, who are new to the market, may still be willing to buy the asset during this phase. Panic: Prices start to fall rapidly as investors dump the asset. The plunge is accelerated if investors borrowed heavily to purchase the asset. All asset bubbles are different, and they don’t always fit neatly into Minsky’s framework. Nonetheless, the framework is a useful tool for evaluating disparate asset classes and attempting to identify bubbles. Applying it to the cryptocurrency market sheds some unique insights. Distributer Ledger Technology (DLT) is the catalyst for the present cryptocurrency bubble. Bitcoin, the first cryptocurrency, relies on a version of DLT known as blockchain. By utilizing a ledger that is shared and visible to all users, coupled with a protocol for achieving consensus amongst all users, Bitcoin holds the promise of being able to send value anywhere in the world near instantaneously, without the need for any intermediaries. The ability to eliminate intermediaries is what eventually attracted traditional financial institutions to distributed ledger technology. While they have thus far shied away from cryptocurrencies, nearly every large financial institution is developing, and in some cases utilizing, DLT for some aspect of their business. The most common DLT use cases are for clearing and settlement, payments, and know your customer and anti-money laundering compliance. Distributed ledger technology has implications beyond finance. Cargill is utilizing blockchain to trace turkeys “from the store to the farm that raised them” and Wal-Mart and other food companies have teamed up with IBM to utilize blockchain to track their food supply chains, which will allow them to respond more quickly to outbreaks of food-borne illnesses. Numerous developers have built their own versions of distributed ledger technology, many of which come with their own cryptocurrency. The most prominent of these, Ethereum, was designed for the purpose of building decentralized applications like smart contracts. The Ethereum platform is now being used by early stage companies to raise funds (typically in the form of Ether) through initial coin offerings. Investors have been quick to seize on the potential of distributed ledger technology. In 2013, $14 million of venture capital investment was made in 7 different DLT companies. Last year, nearly $400 million was invested into 75 different companies. Even more astonishing has been the growth in cryptocurrencies. Almost nine years after Bitcoin’s introduction, there are now over 1,000 different cryptocurrencies with a total market capitalization of over $200 billion. The growth in the cryptocurrency market has coincided with a noticeable increase in media coverage – the Wall Street Journal now has a full time cryptocurrency reporter. Increased coverage has led to greater public awareness; almost 80% of Americans have heard of Bitcoin, although only 14% have ever owned Bitcoin. The price of Bitcoin remained relatively stable over its first four years, hovering between $1 and $15. Then, in mid-2013, as shown below in Figure 1, the price started to gradually increase before reaching an inflection point in mid-2016, after which the price has grown exponentially. While attributing these growth stages to specific factors is difficult, there is no doubt that greater public awareness, brought about by increased media coverage, contributed to the early growth stage. A key feature of most boom phases is the asset’s price begins to exceed the asset’s value. Of course, determining any asset’s value is complicated and, to a certain degree, subjective. It is even more difficult to assess the value of cryptocurrencies because there are no valuation techniques we can borrow from comparable financial assets. Because Bitcoin was originally envisaged as a method of payment, some argue that it should be valued in the same way that fiat currencies are valued. We know that fiat currencies are valued relative to one another, with one common theory stating that these relative valuations should be based on purchasing power parity; “the notion that in the long run exchange rates should move towards the rate that would equalise the prices of an identical basket of goods and services in any two countries.” So if one Bitcoin trades for $7,000, you should be able to acquire an identical basket of goods and services with one Bitcoin as you could for $7,000. The problem with this valuation technique is that Bitcoin is not a widely accepted method of payment – for multiple reasons – and most Bitcoin buyers have no intention of spending their Bitcoins to purchase goods and services. Furthermore, the elements that typically determine purchasing power, like interest rates and inflation, do not exist with Bitcoin because there is no central authority, i.e., government, which controls the supply of Bitcoin. Others would argue that because Bitcoin is primarily purchased as an investment, it should be valued as such, similar to how you would value a stock or bond. However, most stock or bond valuation techniques rely on some form of discounted cash flow analysis, and cryptocurrencies do not generate cash flows. 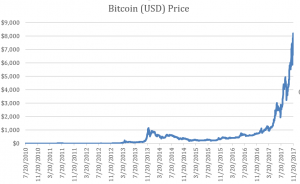 Some have turned to more novel valuation methodologies to account for Bitcoin’s unique nature. Investment manager Andy Kessler argues that Bitcoin should be valued like a software as a service company, one that conducts transactions for a price, like Visa or MasterCard. Based on the volume of transactions and associated transaction fees, Kessler comes up with a valuation for Bitcoin of $3 billion, which is far below Bitcoin’s current market capitalization of $137 billion. Value is always in the eye of the beholder, but when it comes to Bitcoin, it is nearly impossible to come up with any credible methodology that gets you anywhere near Bitcoin’s current market price of approximately $8,000. Thus, it appears as though the only reason people buy cryptocurrency is because they believe they will be able to sell it for a higher price in the future, which is a key feature of the euphoria phase. We are currently in the euphoria stage of the cryptocurrency bubble, where investors are blindly throwing money at anything that utilizes distributed ledger technology. As a case in point, the domain name Ethereum.com is for sale for $10 million. New companies – in some cases they’re not even registered companies but loosely affiliated groups of people – are now using blockchain technology to raise funds via initial coin offerings (ICOs) without even a viable product or credible business plan. At the beginning of the year, the amount of all-time cumulative funding raised via ICOs was approximately $300 million. Today, it stands at $3.5 billion. This astronomical growth has been aided by celebrity endorsements, the modern day equivalent of getting stock tips from the shoe shine boy. The problem has become so bad that the SEC recently released a public statement warning celebrities that endorsements of ICOs may be unlawful under securities laws. Regulators around the globe are recognizing the euphoric nature of cryptocurrency markets and are starting to take action. In July, the SEC analyzed one specific ICO, known as the DAO, and determined that it did qualify as a security and was thus subject to U.S. securities laws. However, the agency stopped short of clarifying the status of ICOs more generally. Other regulatory agencies have been less compromising and have banned ICOs outright, such as those in China and South Korea. Euphoria is often fueled by sensational stories of average folks striking it rich, and there is no shortage of such stories when it comes to cryptocurrencies. Consider the following headlines from the Telegraph and Forbes respectively: “Idaho teenager becomes millionaire by investing $1,000 gift in Bitcoin – and wins bet with his parents” and “Meet The Man Traveling The World On $25 Million Of Bitcoin Profits.” These stories entice more people to jump on the cryptocurrency bandwagon, which pushes the price even higher. The euphoria phase will continue as long as new investors are willing to enter the market. Until very recently, the cryptocurrency investing class has been quite small; consisting primarily of young, tech savvy individuals. This is starting to change now that deep pocketed institutional investors are slowly entering the market. Previously, institutional investors had been unable, or unwilling, to invest in cryptocurrencies. This may have been because they face legal restrictions which prevent them from purchasing unregistered securities, or because they found cryptocurrencies difficult to acquire and too volatile for their risk tolerance. But like the rest of us, institutional investors have observed the exorbitant returns being generated, and it was only a matter of time before they demanded in on the action. Institutional investors will soon have other options for investing in cryptocurrencies. In August, the Chicago Board Options Exchange (CBOE) announced it planned on offering cash-settled Bitcoin options futures by the fourth quarter of this year or early next year, pending review and approval by the Commodity Futures Trading Commission (CFTC). Not to be outdone, last month the Chicago Mercantile Exchange (CME) announced they planned on offering Bitcoin futures sometime in the fourth quarter of this year. Together, these moves mean that institutional investors who were previously turned off by the unregulated status of Bitcoin will soon have multiple regulated alternatives for betting on Bitcoin that don’t require them to own the asset directly. They could have even more options available to them if the SEC approves a Bitcoin ETF, which many market observers expect will eventually happen despite the SEC’s rejection of an ETF proposal this past March. If an ETF does hit the market, the floodgates would open and new money would come pouring in, likely pushing Bitcoin to prices that not even its most ardent supporters could have imagined. A Bitcoin ETF would also provide investors with an easy opportunity to harvest profits, or even bet against the cryptocurrency. New opportunities for investors to indirectly invest in cryptocurrencies will likely prolong the euphoria phase while also facilitating the profit taking phase and ultimately, the panic phase. This is because at present, it is relatively difficult to sell cryptocurrencies: it takes time, significant fees are involved, there can be security vulnerabilities, and there are complicated tax considerations that must be taken into account. In addition, liquidity in cryptocurrency markets is limited, which means that large sell orders can push the price down significantly. Therefore, as things currently stand, even if a cryptocurrency investor believes there is a bubble and wants to cash out, he may not do so, or delay doing so, because of the frictions involved. This changes once regulated instruments are introduced, as they provide much greater liquidity and eliminate many of the aforementioned frictions. They also provide an opportunity to bet against the asset by allowing investors to buy put options or sell futures. If a Bitcoin ETF is introduced, investors would be able to sell it short, providing yet another avenue to bet against the price. Prices spiral downward during the panic phase as everybody realizes the jig is up and attempt to cash out while they still can. Historically, the use of leverage has accelerated the downward spiral because investors who borrowed heavily are forced to liquidate their positions in order to meet margin calls. Currently, there is very little borrowed money at play in the cryptocurrency market, but this will change once more regulated instruments become available. Algorithmic trading could also play a roll in accelerating the panic, similar to how it impacted the 2010 Flash Crash. It has recently been reported that several electronic-trading firms have started to trade cryptocurrencies. While high-speed trading firms have become a fact of life in equity markets, their presence in still nascent cryptocurrency markets introduces new vulnerabilities. For starters, because there is limited liquidity in cryptocurrency markets, high-speed trading firms have the potential to swing prices wildly, and because trading decisions are made by algorithms, there may be no investors willing to buy when the algorithms are telling all the high-speed firms to sell. In addition, electronic trading firms rely on data provided to them by exchanges and often locate their computers near the exchange’s servers to access the market as quickly as possible. However, cryptocurrency exchanges are simply publicly accessible websites and the data they generate is often unreliable; just last week the cryptocurrency exchange Kraken went down for undisclosed reasons. The bottom line is that the presence of high-speed traders further destabilizes an already unstable market and could potentially spark the inevitable market panic. Thus far in Bitcoin’s short history, there have been several events which could have easily been the pin that pricked the bubble. These include: the world’s largest Bitcoin exchange failing in 2014 and losing nearly $500 million in customer Bitcoin; the Bitcoin network being split into two mutually incompatible networks this past August due to disagreements over Bitcoin’s potential to process transactions; China, the world’s largest cryptocurrency market, banning Bitcoin exchanges in September; JPMorgan Chase CEO Jamie Dimon calling Bitcoin a fraud; and a recently abandoned attempt to split the original Bitcoin network in two yet again. These events, and their negligible impact on Bitcoin’s price, have led many cryptocurrency supporters to argue there is no bubble. Such certainty permeated all of history’s asset bubbles. What Bitcoin’s near death experiences do tell us, is that you can never predict when, and how, the bubble will burst. But a careful application of Minsky’s framework to today’s cryptocurrency market does reveal one certainty – this bubble will burst. Exactly what the impact will be when the bubble bursts will be the subject of our next post. Over Bitcoin’s first four years, the price exceeded $15 just 29 times and with a maximum price over this time span of $30. Bitcoin has died nearly 200 times, but it is the honey badger after all and I expect the market cap to only increase after a minor correction. Yes, we can see big variation for a Bit Coin. Most of them started investing in Bit Coin. Nice post. but it is the honey badger after all and I expect the market cap to only increase after a minor correction. Numerous developers have built their own versions of distributed ledger technology, many of which come with their own cryptocurrency.